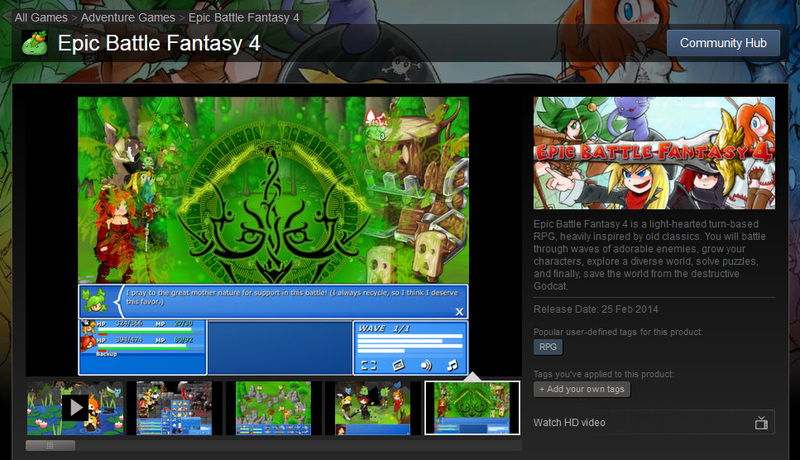 Epic Battle Fantasy 4 is out on Steam! 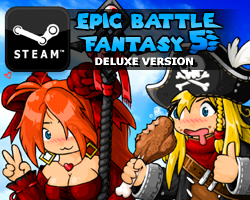 This entry was posted in Epic Battle Fantasy 4, Game News on February 25, 2014 by Matt Roszak. to get the free copy I have to have a steam account? I was played the free version on low quality and with 1GB RAM, I guess it will lag moderately but it will work. Woot! Finnaly! Time to buy this game and check out that premium stuff! Didn’t bother buying it on kongreagate bacuse i wanted to wait for the steam release! Oh, and are you already thinking to make some new game, or are you just gonna take a break for a while? I read on the steam page that there is a lot of references to video games and anime (like Minecraft & Pokémon) so how do you go about it without having copyright issues or something like that? Congrats getting the game on steam!!! I bought the premium version a while back and I was wondering if there is or will ever be a way for me and everyone else who bought it to play the game on steam without having to purchase it again. I wish I could imagine a fraction of what you’re feeling about this, Matt. Is there support for 2560×1400 resolution? Never mind, I ended up buying the game. It only goes up to 1280×720, but fullscreen mode does not have any fuzzies and runs perfectly fine. I’m happy that you’re satisfied with the resolution! Flash can’t really handle anything higher. Woo! Just bought it, can’t wait to go through the whole game again! Los Angeles time zone, sorry for the late messages. You’re not going to get anything. Stop asking, you’re just making people feel awkward. One can hope, and I seriously do not care about anything people think of me, except family. WOW, thanks Matt, I guess dreams come true after all! How do I get my flash save over to the steam version? I bought the game in Steam (nick is chieftain486), but I cannot play it. The first problem is on the “loading screen” – when I click on jumping tiles, they are not disappearing but “freeze” like white silouettes, and they are not respawning. When I move to the main menu and try to start a new game, it just shows black screen with some background music, which does not respond to keys pressed oe mouse clicks. I tried this on two completely different computers (both of them can easily play kongregate-version – I actually did play on them). One of them is W7 x64 with GeForce 560Ti and the other is W7 x86 with integrated intel graphics, and problem is exactly the same on both. What can I do to fix the problem ? Small follow-up. It seems that “Options” act very strange too. All settings are seemed to be unresponding to mouse clicks, but if I click on some setting (with no visual change) and then immediately click “Back” AND then again go into “Options” I see that the last clicked setting is actually applied. In the “Continue”menu the only existing save in slot 1 (I cannot say if I managed to save it somehow ot it was there) seemed to be in glitch mode – it has continuously-fast-switching backgroungs (from all areas of the game), and it does not load anything (same black window when I ckick on it). With my luck I really should work as a beta-tester , but I really hoped to play EBF4 with all premium features and new extras. I think one or two people had similar problems. One guy had a problem because he blocked Flash from creating temporary files, which might be what you’re experiencing. Another guy had a problem starting the game because he had two graphics cards. I checked those possibilities, and none of them applied. Flash is certainly allowed to create temporary files on both computers (besides, I successfully played EBF4 on Kongregate and/or locally with downloaded .swf and standalone Flash Player). Computer with integrated video do not have any other external graphics, and on the second (with 560Ti) built-in intel video was disabled in the motherboard’s BIOS. Still, the same problems Is there any other things I should check ? All problems solved. Disabled cloud saving, deleted and redownloaded game – and everything is all right now! Also, enabled cloud-saving back with uploading new correct save files. 1) Now status berserk is unblockable, may be you merge resist to berserk and resist to burn? Hi matt, i have an answer (actually i think that anyone with the steam game can answer it) the steam game includes the kong pack, but i don`t know if i have to active it or find the wepons or how to do to “activate them” so if anyone can answer me, that would be awesome ! thanks guys! They’re all in the new Battle Mountain area. I love the fact this is happening for you, and I hope you have more success like this. 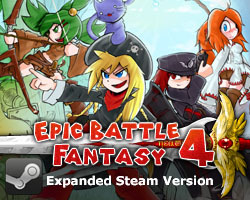 Kinda pisses me off that you’re gettin so much hate for selling EBF4, especially with all the extra content; regardless, thanks for doing what you do. I’ve been playing your games since freshman year of high school, and you’ve released the 4th game on my fourth year, so that pretty much just completes it for me. I absolutely love these games. Thank you Matt. I think it’s bugged. Sorry! Finally got to play the steam version and I REALLY like the intro now. The new Intro Song is waaaaayyyyy better than the original one. Changing that was a good move, it’s pretty awesome now! Are those of us who bought the Premium version on Armor Games going to get a Steam key like you mentioned or will we have to purchase it again? Awesome! Thanks a lot Matt! I look forward to playing the game through again on Steam. Thanks for the code for the free copy of the game. But now here’s a problem. I’m a super noob when it comes to Steam. I’ve never touched it much and for a super long time. So I have no idea how to use the code because the page for the game in Steam only mentions about buying it. Could you give me brief steps on how to do it? Please and thanks! Wait, scratch that. I found it and now I’m downloading it. Yay! Btw congrats for an awesome game! You’re probably best to lower the resolution and avoid High quality. High quality isn’t worth it. Hmm, I have no hiccups with it, and all the settings are maxed out. Then again, I’m running it on an Intel i5 4670k overclocked to 4.2 GHz. and an Nvidia Geforce GTX 680. Kind of impossible to experience lag or slowness with that setup. This will probably sound dumb, but there’s no way to delete accidental save files. Even if you turn steam sync off and delete the meow file…it mysteriously will still load the in-game save even if the save file itself doesn’t exist on the hard drive. What is this mysterious meow magic? Also the ignorance of these people on the steam forums yelling “scam, it’s free on Kongregate” (omg flash game) makes me facepalm. If the majority of gamers, teens or whatever were all aware consumers and did their research before spewing uninformed nonsense, then TotalBiscuit would not be sacrificing his health trying to knock sense into the gaming industry. I hope you’re hanging in there, I imagine a release on steam is stressful; all kinds of idiots flock around the mainstream with no sense of humorous irony when a developer reviews his own game. I thought that was cute…”abusing the review system” really? People have 5-second attention spans and only up-vote the most shallowly written reviews on steam anyway, I mean you made irony on multiple levels there. To delete saves you have to delete the .meow files and the .sol files in your temp folder, WHILE the game is running, or else Steam cloud will back them up. I actually only gave EBF4 about a minute before dropping it when it originally came out which I can’t fathom why, I guess I was living under stressful conditions and couldn’t relax to spend the time required for an RPG. Having just finished it now though…seriously man. The way you managed to design the world map with all the puzzles, interconnected routes and backtracking in mind; pretty impressive planning. Not to mention that the art and animation is top-notch, it has this personal, stylish and unique look. Like really, the animation is so slick and smooth that I never felt like it wasted my time; which I can’t exactly say for most JRPG’s like Pokemon and Final Fantasy. HFX’s music is pretty stellar too, I even downloaded some of her songs back in 2012 and used to listen to them on the bus/gym. The amount of quality packed into one flash game…it really puts the mobile market to shame :P Which is where you are considering to try your luck next right, I recall reading your blog on DeviantArt on why EBF4 was a failure and how the online game market and flash is dead. Many games that didn’t succeed economically, built good will and sentimental value instead; which if it stands the test of time; builds itself a legacy. Depends what you want in life I guess, but I have a great deal of admiration for people who create or express their own original work or personality into the world; if it has a positive influence of course. Very few can make it financially viable, but you’re leaving something behind for the future; a little piece of yourself…rather than just being content with sustaining your existence for a short time. Anyway, I think you perfected the EBF formula with 4; it’s far superior to 3 and I can’t think how you could top it without innovating the gameplay itself. Let me try to explain, I felt the game became quite repetitive 50-70% through after you get your holy/dark gear and can just synergies that with curse/weaken. Despite there being tons of gear and spells, you can only make ONE action per turn; meaning that there is no reason to waste a turn switching gear when you get one shot on Epic. And if I wasn’t constantly reviving and buffing (which on epic might be a waste of turns) there was seldom a better alternative besides just using arrow rain/combo shot, swift slash/legend, pulsar/judgement for the majority of battles. It feels like despite being given a ton of options, you can only make one choice; the most optimal one; having to ignore the rest. There’s a term for this design flaw, but I can’t remember it. The Final Fantasy series for instance had all its useless status effect spells (that should be designed to be proc-based) and always had very flawed gameplay, something you probably learned from by lifting that awful 9999 hp/damage cap. I distinctly remember the best summon in FFVIII called GF Eden doing 35k , so it couldn’t have been a technical limitation. What I mean is, the one action per turn FF battle system feels pretty archaic, it’s like 20 years old. Something like an action points system in Fallout/X-COM, or turn order/speed in Crystal Story/Mardek allows for more depth and player choice. You could simply tweak the power of the skills and maybe add new ones to make them more viable, but eh; everything is easier said than programmed am I right. This is about the only flaw I found with the gameplay, there wasn’t much story or character development as mentioned at the end of the game; but EBF was always a very combat focused series after all. Anyway you decide how to make your future projects of course, I’m just giving a little food for thought after a week with it, I think I’d be excited for a TD game set in this universe with RPG elements. However there’s a lot of excellent flash TDs like Defender’s Quest or Kingdom Rush so it’s a tough market; but no doubt that TD is a very fun and popular genre. Anyway, last post I promise; I’ll probably check on the site every now and then to see what you’re up to as the months/years go by. I know I mentioned having never made direct contact with you, I normally rarely reach out to people or write much online anymore. But I guess I was compelled to try and support you, and at least make some sense among the madness of the internet. You’re a very talented person Matt, I wish you the best of luck; in whatever you choose to do. Farewell. Hey, sorry if I’m being stupid or anything, but How do I get to Battle Mountain and those different battles like boss rushes and etc?